Matlock Bank and Matlock Bridge were two separate entities in the 1890s, divided by fields. Whilst the river is hidden from view, the original football stand can be seen on the Hall Leys; this was the site where the local team played for a long time before transferring to their present grounds. Some of Dale Road, or Dale Crescent as it was sometimes called, was relatively newly built in this picture. In 1887 what were described as "valuable building lots, situate between the Old English Hotel and Brown's Temperance Hotel, Matlock Bridge", were offered for sale at the Old English Hotel by the auctioneers Messrs. Else and Son. The plots were bought by Mr. S. Brown, Mr. W. Moore, two members of the Kirkland family, a Mr J. Taylor and John Taylor (possibly same man), A. Bridge and G. Bunting. Shops were then build from the corner of Old Englishe Road to almost Brown's Hotel - so a large portion of the parade of shops between what became Hunter's to relatively close to the railway bridge. The houses on the left hand side of Dale Road that back on to Holt Lane were built in the early 1880s. The Old English Hotel is of particular interest in this picture. The hotel had been built in 1880; it was four storeys high and had many decorative external features including towers and turrets, supposedly in the Elizabethan style. In 1883 Mrs. Catherine Mattocks applied to transfer the license for the Old English from Joshua Wortley to herself and a temporary grant was made. Unfortunately, on 7 November 1884 disaster struck when fire broke out on the third floor of the hotel in the early hours of the morning. Mrs. White of Holt Lane and a Mr. Elliott were the first on the scene and managed to rouse all the Mattocks family. The staff then evacuated the guests and many items of furniture, including two pianos, were saved. The nearest fire engine was at Masson Mill, some two miles away! Unfortunately, despite valiant efforts of the fire fighters, the local police and neighbours, the roof caught fire. The Derby fire brigade was also sent for and they arrived at 8a.m. The interior of the building was burnt out apart from the vaults on the northern side. The Derbyshire Courier reported that the tower was destroyed, slates gave way, the roof fell in and the framework of one of the windows crashed into the street; bare walls only remained. Almost nobody was injured although the confectioner Mr. W. H. Moore burnt his hands quite badly; he had noticed showers of sparks falling upon part of his premises where he had hay stored and seems to have put out the flames there single handedly. Whilst the fire was raging three local men attempted to make off with one of the barrels so they could consume the contents, and were hauled before the magistrates. can be seen behind the restored and rebuilt hotel. In January the following year a number of men were removing the debris and found molten gold and silver, including a gold watch. It was said at the time that arrangements had been made for rebuilding, and a similar structure to the one erected in 1880 was to be built. Mrs. Mattocks needed to apply to renew the hotel's license in September. The property had still not been rebuilt or restored and it was said that the premises were totally unfit for the class of business for which the license was originally granted. Mrs. Mattocks told the court that it was intended to spend about £3,000 on the erection of the new building, which would contain seventeen bedrooms, and all other requirements for a first class commercial and family hotel. The Council agreed to renew the license on the distinct understanding that the new portions of the building were proceeded with as quickly as possible. The work on the hotel was carried our between the license being granted and the land on Dale Road being sold; there is a picture of the restored Old English but with the land on the opposite corner undeveloped, dating from about 1887, in David Barton's book about Matlock. All the images of the hotel after the fire show the Old English was reconstructed with only three floors instead of four and with alterations to the dormers and other features on the Old Englishe Road side of the building. 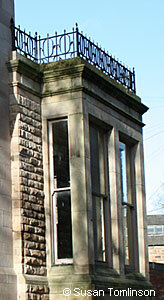 At the rear of the hotel is a large bay window, also part of the original structure. 1 and 2. "Matlock Bridge & Matlock Bank". No publisher (Post Card - Great Britain & Ireland on the back). Not posted. 3. Photograph of the rear bay window © Susan Tomlinson. "Derbyshire Times", 20 August 1887. "Derby Mercury", 18 Jul 1883. This was before Mr. J. W. Skidmore, solicitor. 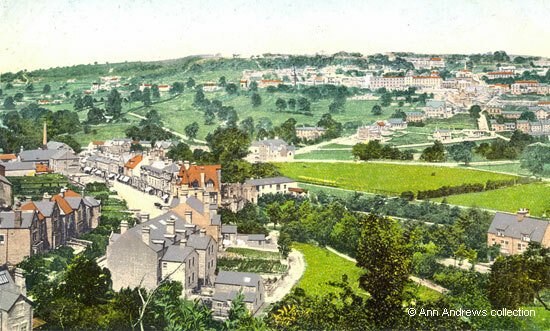 The Mattocks family were already living in Matlock Bridge when the 1881 census was taken. They had been in Matlock Bridge since at least 1864 at Mr. Mattocks advertised in Kelly's 1864 Directory. The family were also shown in the 1871 census and Mr. Mattocks was also included in Kelly's 1876 Directory. "Derby Mercury", Wednesday, 12 November, 1884 (Great Fire at Matlock Bridge). This was just one of many newspaper reports. 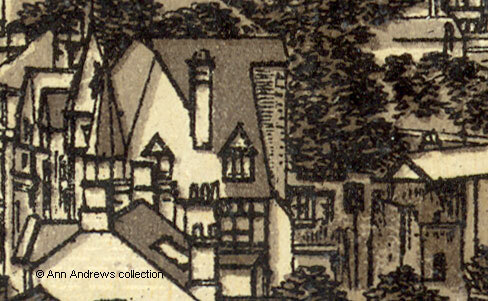 "Derbyshire Courier, 15 November 1884 (Destruction of the Old English Hotel. Damage £12,000). The paper described it as "one of the most serious fires that has ever occurred in North Derbyshire". "Derby Daily Telegraph", 16 January 1885. Matlock Police Court, before Mr. Sleigh, Mr. Arkwright and Mr. Sorby. "Derbyshire Courier", 19 September 1885. Barton, David A. : Collected by (1993) "Around Matlock in Old Photographs", Alan Sutton Publishing, Stroud. ISBN 0-7509-0502-6.